Upper part of Cross shaft. 46.2cm (18.2'') high, 29cm (11.5'') wide, and 15.2cm (6'') thick. Stone type: Medium-grained, calcareous, very pale brown sandstone. 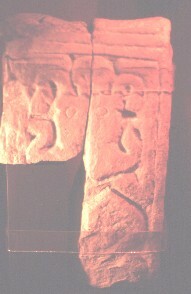 Upper part of cross shaft, in two pieces, dated to tenth century. There is a flat edge moulding along the top of the fragments. At the right, at the base of the fragment, there is a head with a pointed hat or helm. At the top across the whole width there is a human figure with its legs and elbows raised in a crab-like manner.